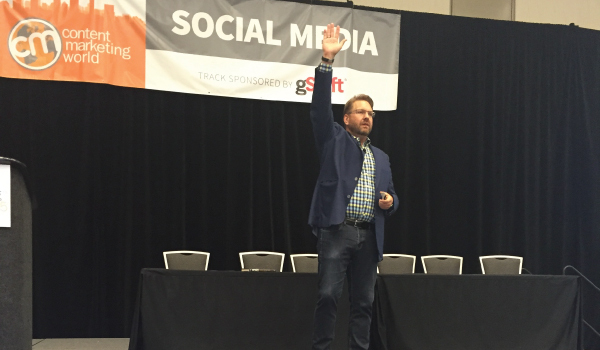 Yesterday at Content Marketing World, TopRank Marketing CEO Lee Odden delighted a packed room of marketers by providing inspiring and actionable advice on how to successfully approach participation marketing. 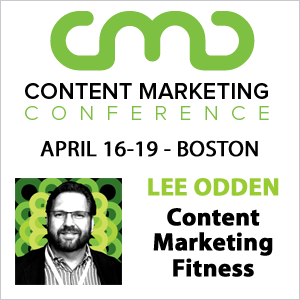 Lee assured marketers that if they wanted to produce quality and scalable content, without having to scale marketing budgets, this was the place to be. A methodical approach for deconstructing and repurposing marketing to make it more useful. How to integrate influencers, social and SEO into your content plan. Ways to make your content more useful for contributors and your audience. Evergreen: Always relevant for your audience, content that stands the test of time. Co-Created: Created with others such as internal experts, influencers or your online community at large. Curated: Finding, collecting and sharing content with your audience that focuses around a specific topic. Repurposed: Taking a piece of existing content and using it in another way. Quality: You are able to tap subject matter expertise. Specificity is what rises to the top. Quantity: Create even more quality content consistently. Engagement: Create a connection with subject matter experts and influencers. Create an experience. Use it as a means of networking so that it creates an engagement opportunity. Reach: Participation inspires action. If we all create it together we have a mutual interest in making it succeed. Scale: Distribution of your co-created content. The lens for your brand story should be empathetic to customer needs. Once you identify what it is that you or your product stands for, you need to become the best answer wherever your customers are looking. What problem does it solve for customers? If you’ve had no previous interaction with influencers, it’s essential that you show relevant signals of friendliness. This could mean following them on social networks, retweeting or sharing their content, live blogging their conference sessions or commenting on their posts. This helps create exposure for the influencers and create a connection of your support. A good practice is to include a healthy mix of brandividuals and niche influencers in your co-created content. When reaching out, personalize your message based on topics they are known for and what you’ve discovered motivates your influencers. Always set clear expectations and deadlines, but be patient as these influencers likely receive multiple requests a week to collaborate. Never rely on the fact that just because someone co-created with you, they will share your Content. You have to make it easy, fun and inspiring for influencers to share by providing a preview of their contribution or including some pre-written tweets for them to share. To collaborate with busy influencers, it may require some sort of compensation or trade. Don’t be afraid to do a little research to see what they like (or just ask them). Measuring the success of your co-created content is one of the most important, and often overlooked elements of your campaign. TopRank Marketing recommends an attract, engage and convert model to cover all of your bases. Now that you have the essential steps for participation marketing, it’s time to see this concept in action. We’d like to invite you to co-create some killer content with the team at TopRank Marketing. All you need to do is click the link below and submit your biggest question about participation marketing. As an added bonus for collaborating, you will receive access to the TopRank Marketing Content Co-Creation Checklist to help with your own participation marketing initiative.